2019 Elite Technique Academy (Schaumburg, IL) – This Technique Academy consists of 5 individual clinic sessions over five days to improve ALL ASPECTS of participants’ racing. This is an “Elite” Academy which means that each session is limited to no more than 35 participants. Sign up for individual sessions or ALL of them by clicking register now. Each of the first four days of the Academy will focus in detail on each of the strokes plus STARTS. The week will culminate on Day 5 with a focus on race preparation including crisp turns, underwater dolphin kicking and applying what was learned during the week at race pace. At each session we will be in the water demonstrating and making corrections to the participants. We will also use video to exemplify elite mechanics and race strategy. Participants will complete the camp as stronger, more confident swimmers… and with the understanding that big improvements come from small, consistent changes. Leading each session of this camp is Elite Clinician and Olympian Scott Weltz. We expect swimmers from throughout the USA to come to this camp to spend five days learning from him! Local swimmers have a very special opportunity. SAVE! Sign up before prices rise or the sessions fill up! The Academy consists of 5 clinic sessions for swimmers ages 13 & over and five sessions for swimmers ages 9 to 12 who have at least two years of competitive experience. Swimmers younger than 9 years old are not recommended for these clinics without their coach’s suggestion. Prices will rise April 25th! On Day 1, Olympian Scott Weltz will work with the participants to improve on the complexities of balancing power and fluid rhythm in one of the most dynamic athletic movements. Elite butterfliers maintain forward momentum by setting an immediate high catch with a perfectly timed kick. They are committed to a breathing pattern, perfecting their distance per stroke, and maintaining a horizontal body position - become committed to these same skills...make them YOUR habits. Body Position: Elite butterflyers focus on driving their momentum forward with minimal drag by keeping their heads low and hips high. Participants will work with Scott Weltz on establishing and maintaining the proper body position. Kick: Each butterfly stroke has two equally strong and well-timed kicks. Work on how and when to kick in fly for maximum speed. Pull: Long and smooth strokes will allow your swimmer to have a more efficient butterfly. Scott will teach participants to get an early catch on the water for more power in each stroke. Breath: The most common mistakes that swimmers make in fly occur during the breath. Swimmers will work on low and efficient breaths as well as WHEN to breathe so that they can swim more efficiently on the breath stroke. Underwater Dolphin Kicking: The not-so-secret weapon of elite level swimmers is their underwater dolphin kick. The fastest swimmers in the world are faster underwater than on the surface and they utilize this skill. Scott Weltz will teach your swimmer how to unlock the speed and power of their underwater dolphin kick to generate more speed leading into their breakout. Your swimmer understands main components of backstroke, now begin to master the subtle skills that will help your swimmer compete at a higher level. Participants will practice using their core to create rotation as well as a stable and balanced stroke, build a powerful pull with a strategic use of stroke rate, and use their kick as a dominant propulsive force. 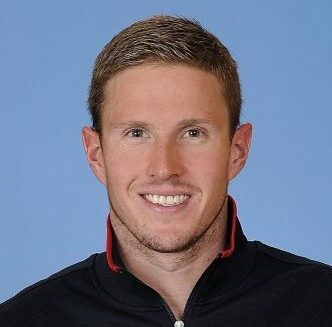 Body Position: Participants will work with Olympian Scott Weltz to feel and understand how to maintain a neutral spine and head position for less drag and better full body connection in backstroke. Kick: Have you ever noticed how many swimmer's knees break the surface when they kick in backstroke. This means that the swimmer is kicking with their knees which is less efficient than kicking from their hip. Scott will help swimmers maintain maximum propulsion with the proper kicking technique. Pull: It is very important for swimmers to bend their elbow very early in the pull so that they can get an early catch for an immediate and powerful press back into the water. Rotation: The fastest backstrokers in the world use a powerful rotation to create more power and increase their tempo. Learn how much to rotate, when to rotate, and how to use it for maximum speed and power. Backstroke Starts: Getting into the right ready position utilizing the backstroke ledge with a straight back, hips high on the surface of the water, and feet positioned to get maximum power is extremely important to being able to execute a fast and clean backstroke start. Scott will work with swimmers at this session to achieve a beautiful back arch over the water so that they can have an advantage in every backstroke race! More than any other stroke, breaststroke is the most varied. Out of the eight finalists at the Olympic Games you might see eight different styles of strokes! Without fail, your swimmer's timing and ability to eliminate resistance are both hallmarks of an efficient and powerful breaststroker. Your swimmer has the foundation, now learn from the expert how to utilize your core and hip drive to create a fluid and more forward driving stroke. BODY POSITION: The best swimmers in the world learn at a young age about the importance of being patient with their stroke and trusting their "glide position". Too many young swimmers rush their stroke, create "drag" (i.e. slow themselves down) and exhaust themselves. Scott Weltz will work with participants to maintain a better body position for a more efficient breaststroke. Kick: The three parts of the kick are hips, knees, and feet. Scott will work with participants to kick with power from their hips while keeping their knees close and feet wide. The kick is about 80% of the power in breaststroke. Get more out of each kick for a faster breaststroke! Pull: Participants in this session will learn drills to encourage you to keep your hands and elbows high on the water throughout the entire pull, thereby minimizing resistance and maintaining speed. 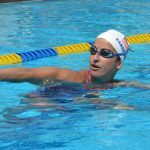 Timing: A fast breaststroke is all about the rhythm! The proper timing will make your stroke fast, smooth and less taxing on your body. Learn how your clinician times their breaststroke for ultimate efficiency. Starting Position: Your swimmer will work with Scott Weltz at this session to ensure that they have established the proper "ready position". Their feet should be apart enough to be balanced and to get a good jump with hips high and a neutral head position. With the right muscle activations, your swimmer will have a faster reaction time and a more efficient start. Freestyle is the stroke that you swim more than any other. Creating good freestyle habits will not only help your swimmer race fasster, but it will also help prevent injury in the future. Olympian Scott Weltz will be in the water leading participants through each part of the freestyle stroke and drills to help them create muscle memory with proper technique and deepen their understanding of fast and efficient freestyle mechanics. Bodyline: Your swimmer's freestyle will never be fast without a strong bodyline. Your swimmer will renforce good posture and engage their core to have a strong foundation for a faster freestyle. Kick: Become a stronger and faster kicker through learning about both the technique and timing of each kick from an Olympian. Pull: The best swimmers in the world utilize an early vertical forearm to put immediate pressure back on the water. Scott will also teach swimmers how to get maximum extension and a powerful finish! Learn new drills and exercises to get more power out of every stroke! Rotation: Participants will learn to utilize their rotation form more connection and power out of every pull and every kick. Breath: All swimmers know to keep one goggle in and one goggle out when they take a breath, but do they know when and how long to breathe? Scott will show your swimmer how to make each breath more efficient for faster freestyle racing no matter what distance. Starts: Many swimmers forget to be actually use their their arms AND legs off of the start. It is very important top pull on the block with your arms and jump through your legs in order to get more speed and power in the air. Scott will help participants learn how to be more explosive and dynamic as they leave the blocks. Races are often won and lost because of the quality of turns and finishes of the competitors. Many people don't realize this, but the push-off and streamline from the wall after a turn SHOULD BE the fastest a swimmer will go while in the water other than the streamline after a dive. Even elite level, swimmers often add in extra movements on their turns and finishes that slow them down and even cause them to lose races that they could have won. At this session, Olympian Scott Weltz will work with each participant to maintain their momentum at these key points in a race. Flip Turns: Your swimmer will learn how to carry their momentum through the turn to get in and out of every wall faster. Swimmers will practice accelerating into the wall with long strokes and then using their core and arms to get through the turn. They'll practice planting their feet on the wall for a powerful pushoff in the perfect streamline. Scott will give the swimmers drills and exercises to help them master this athletic skill now as well as in the future! Finishes: Many races come down to the very last stroke. Your swimmer will learn how to drive their legs, elongate their arms, and keep their head down so that your swimmer doesn't waste any time or strokes as they approach the wall. Race Practice: To wrap up this 5 day camp, participants will get the opportunity to prove what they've learned by racing each stroke! Swimmers will be challenged to swim all out with the skills and techniques that they learned over the course of the week and then maintain that form through fatigue. Each day, swimmers and parents are invited to ask Scott questions during a Q&A session. Gain insight into his training regimen, diet and nutrition, and recovery tactics. Observe Scott swim at full speed and demonstrate a progression of perfectly executed drills to achieve powerful, efficient and fast swimming. Get your heartrate up with one of the best swimmers in the world and watch his near-flawless technique - achieved by practicing the same drills he will teach you. Take a photo while wearing Scott's medals, get autographs, and receive a special gift from our sponsors! Scott Weltz is an Olympian who now coaches at UC Davis! He is one of the best clinicians on the tour because of his clear descriptions of technique and effective drill progressions all while maintaining a very cool and approachable demeanor. Scott will help all participants find the fun in the hard work so that they get excited about training and racing FAST! There are spots available in the hands-on coaches program. If you are interested in meeting and working alongside our elite clinician during the clinic, please click the register button for the coaches program. We are so appreciative of the hundreds of parents and coaches who have volunteered their time at Fitter and Faster clinics since 2009!